I am not a person who can readily identify birds, dragonflies, or butterflies “on the wing”, at least at first. I need to take pictures, and then sit down with a series of guide books to try to figure out species. But just flipping pages between the species accounts can give me trouble matching up distinguishing marks — I forget what one looked like while looking at another. I need comparison charts! 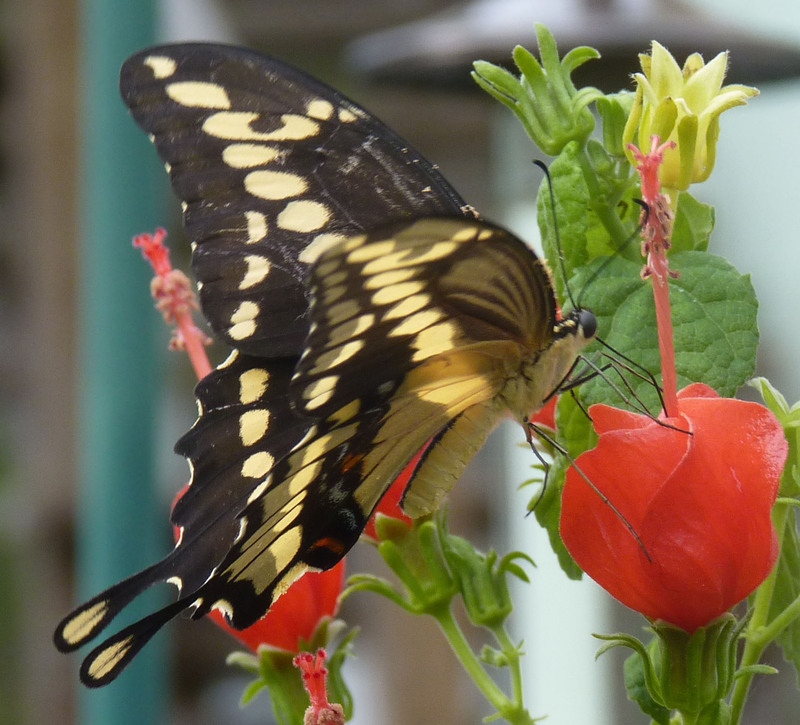 Giant Swallowtail – black with huge yellow dots. Tiger Swallowtail – pale yellow with black stripes. The swallowtails that are black with blue coloring are harder for me to keep straight, and added to this mix is a swallowtail mimic, the Red-spotted Purple (which has no red and no purple, only blue and orange). So here is a little cheat sheet, and you can click on any picture to see it larger. Pipevine Swallowtails have no black lines breaking up the blue field, and there are only small white ripples along the edges of the forewings. Spicebush Swallowtails have large dots of white along their wing edges. Female Tiger Swallowtails (black or dark forms) have a delicate area of blue with a black band breaking it up, and medium size light dots and a ripple on their wing edges. Red-spotted Purples have the same coloring, but they do not have the swallowtail, and are in the Nymphalid family. They are thought to be mimics of Pipevine Swallowtails. Pipevine Swallowtails’ undersides — blue on outside edge, 1 row of orange dots toward center, bodies can appear blue, with a row of smaller white dots. Spicebush Swallowtails’ underside – two rows of orange dots with blue in between, and a row of big white dots on their bodies. Tiger Swallowtails’ underside- orange dots on edge, thin blue line, solid black body. 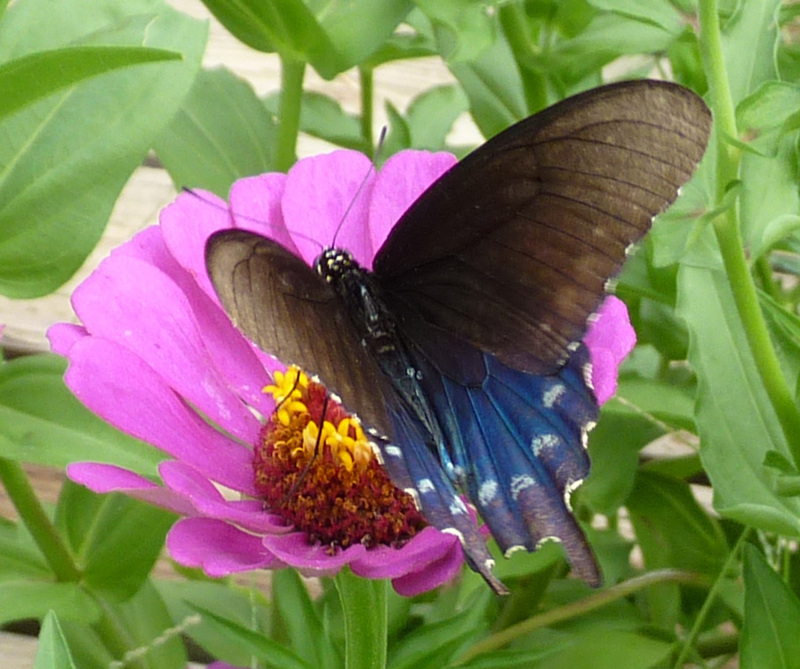 Red-spotted Purples’ undersides – delicate blue and orange sections all the way up their wings, but no swallowtail. Pipevine Swallowtails can appear plain black or iridescent blue, depending on the angle of the light. These two photos were taken of the same butterfly as the Pipevine in the cheat sheet above, an hour later, so the light was a little different. 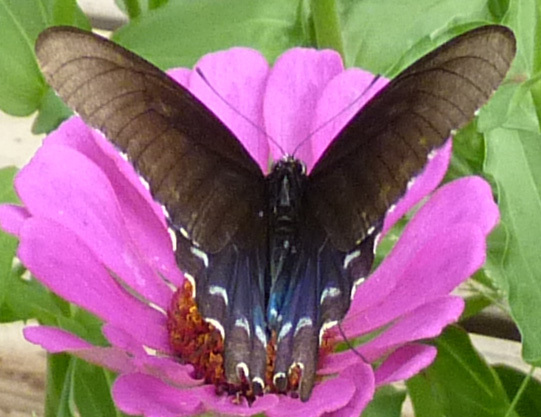 Same butterfly as the Pipevine above – wings at a different angle show the blue more faintly. At this angle, the blue is hardly visible at all. Two butterfly books that I use often are Butterflies of Houston and Southeast Texas by John and Gloria Tveten (1996, University of Texas Press), and the Audubon Society Field Guide to North American Butterflies (1981, Alfred A. Knopf, Inc.). 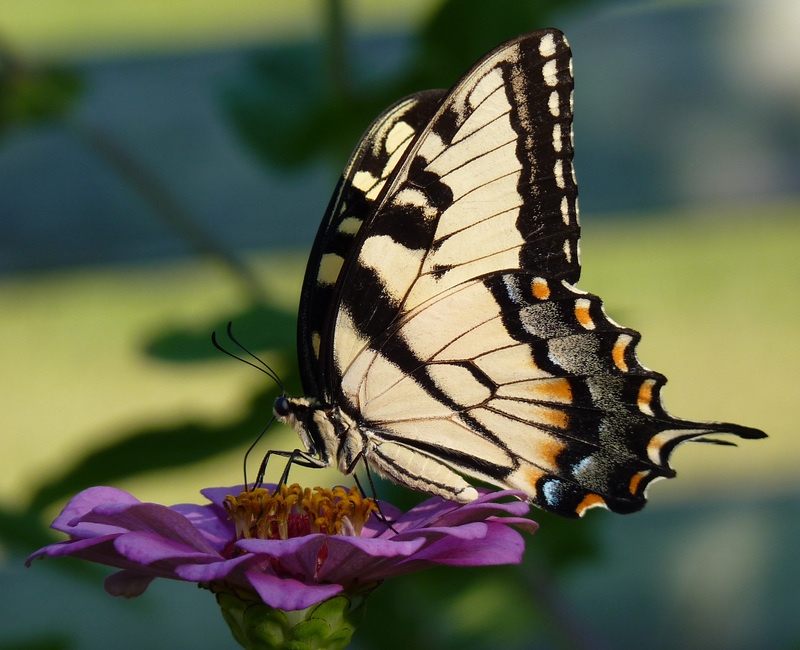 Absolutely beautiful photos and description of the swallowtails. These butterflies are gorgeous to look at 🙂 I think having a comparison chart is a wonderful idea. Thank you so much for sharing this. It helps me so much to see all the individuals in the same pose – the Sibley Guide to Birds has comparison charts like that and it has helped me so much when I try to identify what I have seen! It gave me the idea to create comparisons of my own.